Product prices and availability are accurate as of 2019-04-05 11:08:11 EDT and are subject to change. Any price and availability information displayed on http://www.amazon.com/ at the time of purchase will apply to the purchase of this product. Adjustable toilet fill valve from 8" to 13". Features a fast powerful flush & quiet water fill. Anti-Siphon technology keeps drinking water safe. 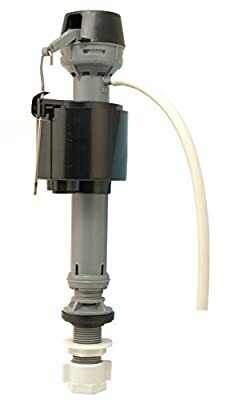 Replaces Ballcocks with float balls or fill valves Includes 6 color coded Water Flow Adjustment Caps to adjust water savings up to 38%. Toilet repair kit/float valve fits most 2 piece toilets including: American Standard, Kohler, etc. Easy installation. Includes Perfect Flush Valve, refill tube.